If you would like to enjoy the benefits of a hot tub outdoors or on the go, say when camping, then you need to a portable hot tub. These portable units are rapidly gaining in popularity because they are cheaper, perform almost the same as their in-ground counterparts and are easier to set up, requiring only to be inflated, after which they acquire their shape so that you can fill water inside. However, with their increase in popularity, a large number of them have emerged and thus, selecting a good tub might be a little bit difficult if you don’t know what to look for. For this reason, this article looks at some of the best portable hot tubs that you can find in the market. Coleman’s SaluSpa is our choice for the best portable spa because it is relatively affordable, yet it has an impressive list of features. For starters, the unit can accommodate up to 6 people in 254 gallons of water, making it ideal for small and large families. In addition to this, it has a total of 120 air bubble jets that are placed all around the interior, and these are enough to provide a lazy massage to all the occupants inside. In terms of control, this spa has an easy-to-use digital control panel that adjusts all the internal mechanisms, from activating the air jets and filtration systems to controlling the heat settings. This gives you an enjoyable time in the tub, especially considering that the panel is within reach and thus, you can make any changes you want while still in the water. Structurally, although inflatable, the spa has an I-Beam construction, which gives the walls the strength to hold water and also to support a person sitting on the side without buckling. For the outer skin, a tough TriTech 3-ply reinforced material is used, and it consists of a polyester mesh core that is sandwiched between 2 PVC layers. This gives it the strength and durability required to last for a long time. Other features include a cushioned air pad floor, an inflatable cover, a ground cloth for installation and a chemical floater for water maintenance. 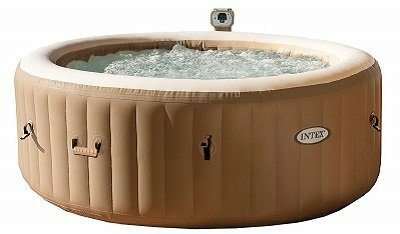 Intex’s PureSpa is the most affordable portable hot tub in this review, but this does not mean that it is substandard. In fact, it has a similar number of air bubble jets (120) for the lazy massage as Coleman’s SaluSpa above. On top of this, the unit has an electronic hard water treatment system that agitates the salt and mineral crystals so as to suspend them in the water, after which they are easy to capture using the included filters. Eventually, this process softens all the water in your spa and makes it gentler to your skin and also gentler to the pumping and heating systems because no salt layer forms on them to reduce their efficiency. All you have to do is replace the tub’s 2 filters regularly so as to get rid of the minerals continuously. Construction wise, this spa is made using a fiber tech technology, which includes I-Beams and a puncture resistant skin, consisting of a 3-ply laminated material. This ensures that you get the best in support, durability, and comfort. Other features include an easy-to-use control panel, grab handles and a carry bag for easy transportation, a thermal ground cloth, and a floating pool chlorine dispenser. On the downside, this spa can only accommodate 4 people max, although there is a large 6-person capacity option, which comes at a higher price. Room temperature must be at a minimum of 50°F in order to reach max water temperature (104°F). Coleman’s 13804 is the smallest portable hot tub, measuring in at 71 inches in diameter and 26 inches in height. Although this means that the unit can hold only 4 people inside, it makes it easier to fit in tight spaces, easy to transport and also easy to set up, and for these reasons, the 13804 is the top-rated portable hot tub in this review. Apart from that, the spa is also easy-to-use, featuring a digital control panel with soft-touch buttons for adjusting the temperature settings between 68 - 104°F, activating 60 surrounding air jets and activating the filtration system. For strength and durability, the spa’s walls are made of a tough 3-ply material, which consists of 2 PVC layer over a polyester mesh core. Support is provided using an I-Beam construction, which forms the frame of the walls and makes it possible to sit on them without buckling. Other features include a chemical floater for water treatment, an inflatable cover and 2 easy-to-replace filter cartridges. On the downside, this portable hot tub is relatively expensive, especially considering that it can only accommodate a maximum of 4 people inside. Intex’s Pure Spa 28409E is one of the best portable spas in the market because it offers the best soft, lazy massage. This is because it has 170 air bubble jets, which ensure that you get submerged in a cloud of massaging air bubbles to soothe your muscles and leave you very relaxed. Although expensive, this unit also comes with 2 headrests that add a touch of luxury by providing this comfort to 2 of the 6 occupants that it can accommodate inside. This means that you can rest very comfortably, especially if you are planning to be in there for a while. For an even better spa experience, the 28409E features a hard water treatment system, which electronically agitates the salt and mineral particles so as to suspend them in the water, after which the filtration system captures them in the cartridges, leaving soft water in circulation. Soft water is gentler on the skin and thus, you get a more relaxing treatment. Additionally, soft water is also gentler on the pumping and heating systems because it does not form mineral layers over them. Therefore, your spa’s internal mechanisms will function very efficiently. On the downside, this hot tub is quite big in size, measuring in at 85 inches in diameter and 28 inches in height, which makes it harder to inflate in tight spaces. However, this means that you get a large volume of water (290 gallons) to play around with. SaluSpa’s Palm Springs is a fast and easy-to-setup portable hot tub because the inflation is done using the spa’s pumping system and thus, no tools are required during this process. In addition to this, the unit also has an easy-to-operate digital control panel, which is accessible as you sit in the water. This panel is used to activate the filtration and lazy massage systems, as well as adjust the temperature settings, including operating the automatic start/stop timer of this heating system. For the lazy massage system, a total of 120 air bubble jets are installed around the tub’s interior, and these provide enough bubbles to cater for the maximum of 6 people that it can hold inside. Construction wise, the Palm Springs is circular in shape and is built using a strong TriTech 3-ply reinforced material as the skin, consisting of 2 PVC layers over a polyester mesh core, so as to resist puncturing. The entire structure is supported by an I-Beam construction, which strengthens the walls, while a cushioned air pad floor provides additional comfort under the feet and also prevents heat loss to the ground. Other features include a chemical floater and a cover to help maintain the water temperature when you are heating it before use. Intex’s Pure Spa 4-person hot tub features a 120 high-powered, air bubble jet massaging system, which produces heated air bubbles that also help to heat the water more effectively and this improves the overall spa and massaging experience. As is customary with all Intex portable spas, this one features a built-in, electronic hard water treatment system, which agitates minerals in the water and suspends them for easy removal using the filtration system. On the other hand, the filtration system has 2 easy-to-replace filter cartridges for getting rid of these minerals and other debris, and the tub comes with 6 of them, in which 4 are spares when the others are filled up or get worn out. In terms of structure, this unit has a durable fiber tech construction that includes a tough 3-ply reinforced material for the skin and 48 fiber tech beams all-round for supporting the entire structure. Other features include an easy-to-use digital control panel and a cover for keeping the dirt out and the heat in when warming up the water before use. Portable hot tubs usually have jets that are specifically placed to imitate a number of massage types. This enables them to offer specialized hydrotherapy sessions that are customized to work on a particular area of your body. On the other hand, in-ground tubs usually have one type of jet per seat, with its pressure or volume not being easily adjustable. This makes it difficult to customize the massage delivery and thus, the types of massages that are offered are not as varied as in portable spas. For comfort, portable units feature ergonomic seating to accommodate few people with different heights, while some even have headrests for additional comfort. In-ground spas also accommodate few people, mostly with a bench type of seating, which is less ergonomic. Portable hot tubs are very versatile in terms of fitting. They can be placed on patios, lawns, dug into the ground or even positioned inside a deck. They are also available in different shapes and sizes for fitting into the space that you have. On the other hand, in-ground hot tubs are also versatile, but in terms of shape and size. You can build them into any form so as to match your landscape and it can be as big as you want. Portable tubs are easier to maintain because they come with inbuilt treatment systems such as filtration, hard water, and oxidizer systems, among many others. They also come with covers to help keep out the dirt while also maintaining the water temperature inside. For in-ground units, you have to maintain the water quality in the same way as in portable tubs, but their tiled walls can be cumbersome to clean. You also have to buy the filtration and other treatment systems separately because they do not come with the tub. The first thing to consider when buying a portable hot tub is its capacity. This basically means that you check the number of people it can accommodate. If you have a big family, then you need to look for a bigger tub, say for 6 people maximum. However, if you have a small family, or if you just want to enjoy the spa with your spouse, then a 2 – 4 capacity hot tub will do. Buying Guide: Ultimately, a bigger portable hot tub is better even if it's for one person because you will have more water to play around in and a larger surface area for massaging your body. However, the bigger it is, the more expensive it is to buy and maintain. If you can afford to buy a big spa, then go for it. However, if you are on a budget, a small one will still do. The number of jets ultimately determines the quality of massage and the overall spa experience that you will get. Fewer jets do not have a very big impact on the massage therapy and thus, spas with few jets are inferior to the ones with a higher number of jets. Another thing to consider is whether the portable hot tub has air or hydro jets. Generally, hydro jets offer a smoother massaging experience and can be controlled in terms of direction and flow. This makes spas with such jets more expensive than the ones with air jets. Air jets are only controllable by turning on and off, but this does not make them very inferior. They are also highly effective at providing a soothing massage. The ideal portable hot tub should be very strong and durable. For this reason, it is important to check for features such as a strong frame construction, typically consisting of I-Beams for wall reinforcement, and a tough skin for keeping it safe from accidental contact with sharp objects. Additional features are always a plus and some are actually very essential in improving your spa experience. For instance, having a hard water treatment system can make the water soft and thus, very gentle on your skin. Soft water is also gentler to the heating and pumping mechanisms, resulting in a longer lifespan for the tub. Other features to look for include LED lighting, which creates an accent that sets the mood for the hydrotherapy session. Some high-end models even have built-in sound systems, which provide you with entertainment as your body muscles undergo some relaxation. #1. How do I set up my portable hot tub? Not all portable hot tubs are inflatable. Therefore, setting up depends on the type of portable spa that you buy. Find a flat, even surface with no debris to place the tub on. Unbox and inflate the tub. Connect the pump to the tub through the labeled waterways. Once inflated, fill with water. Power the pump and control panel. Adjust the temperatures then enjoy your spa. Fill with water and add some treatment. Connect to a power supply. #2. How often should I clean my portable hot tub? The recommended time to clean the tub is once a month, but this depends on how often you use it. Sometimes just by looking at the tub’s walls will tell you its time to do some cleaning. #3. When is it best to change the hot tub’s water? You should change the spa’s water every time you clean it. This is usually once a month. #4. Is the portable hot tub safe for children? Portable hot tubs are safe for older children but under a parent’s supervision. For younger children, use the smaller baby bathtubs. As you can see, there is probably a lot of information about portable hot tubs that you did not know about. However, after going through the portable hot tub review above, you should be more enlightened about the different types of these products and thus, be in a better position to buy the best portable hot tub that suits your needs.